Natural source marine oil with omega-3.Our experts have identified 7 key needs for men and developed those into Perfect7 Man, a combination specifically designed to support you from the inside. 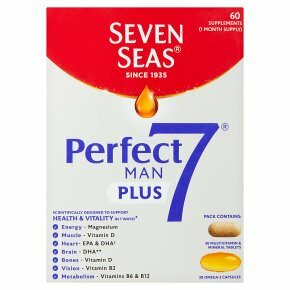 Perfect7 is a blend of Natural Source Marine Oil with Omega-3 plus essential multivitamins and minerals. The special formula provides effective absorption of nutrients in your body's cells to support you from the inside as you get older. Perfect7 Man has been scientifically designed to support: 1 Energy - Magnesium contributes to a reduction of tiredness and fatigue 2 Muscle - Vitamin D contributes to the maintenance of normal muscle function 3 Heart - EPA & DHA contribute to the normal function of the heart 4 Brain - DHA contributes to normal brain function** 5 Bones - Calcium is needed for the maintenance of normal bones 6 Vision - Vitamin B2 contributes to maintenance of normal vision 7 Metabolism - Vitamins B6 & B12 contribute to normal energy-yielding metabolism **The beneficial effect for brain function is obtained with a daily intake of 250 mg of DHA The beneficial effect for the heart is obtained with a daily intake of 250 mg DHA/EPA. Dosage Take one tablet (Blue blister) and one capsule (Silver blister) a day with a cold drink. Do not exceed the recommended dose. Food supplements should not be used as a substitute for a varied diet and a healthy lifestyle. KEEP OUT OF THE REACH OF YOUNG CHILDREN. THIS PRODUCT CONTAINS IRON WHICH CAN BE DANGEROUS TO YOUNG CHILDREN IF CONSUMED IN EXCESS.